Polydrusus impressifrons, also known as the the leaf weevil or pale green weevil, is sometimes found in large numbers in nurseries in the late spring/early summer. This weevil is European in origin and first found in New York in 1906. They are reported to feed on leaves of trees such as apple, birch, black locust, blueberry, elm, linden, oak, peach, pear, plum, poplar, rose, strawberry and willow (Beers et al, 2003; Rosetta, personal observation). They are rarely considered a pest but shade tree growers might want to inspect for terminal feeding and loss. Their feeding can be more of a problem on smaller, liner-sized plant material. Their larvae feed on roots. Niedbala, J. 2012. 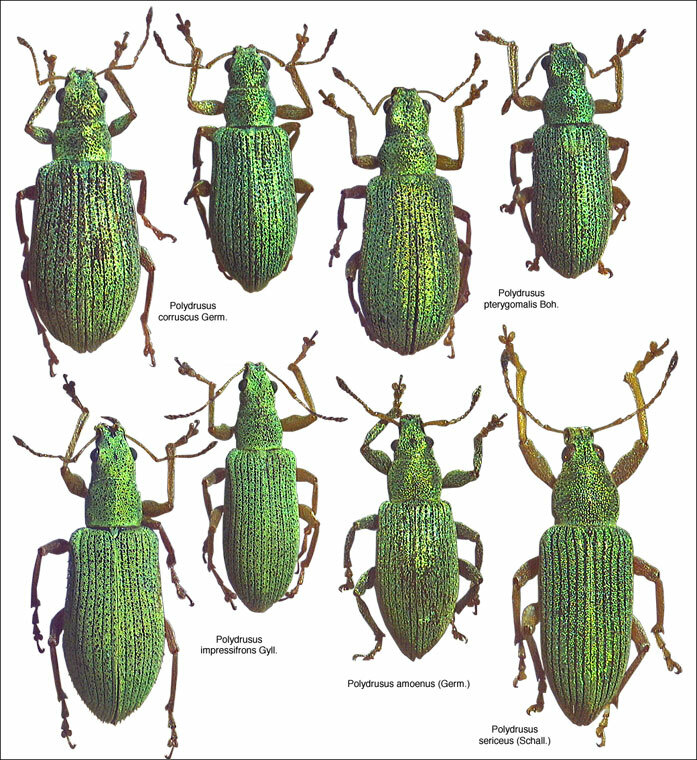 Biology of a little known weevil: Polydrusus impressifrons. <Nov. 12, 2012). Nice images of various Polydrusus weevil species along with helpful hints to distinguish P. sericeus and P. impressifrons are available at the BugGuide webpage on these weevils.